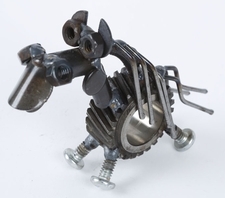 Measures Approximately 4.5" x 1.5" x 3.5"
Yardbirds Chubs the Horse sculpture is part of the Engine-New-Ity collection created from recycled car parts. These small animals make great paper weights or look wonderful anywhere you just need that little extra. *This item is shipped FREE! These American made small animal figures of the Engine-New-Ity collection are works of art created using recycled car parts by Richard Kolb, and are handcrafted in Louisville, KY.